I’ve learned the art of saying “I’m sorry.” And so has Nick. These two little words can instantly transform an edgy moment into laughter and a loving embrace. This is definitely my favorite defuser. It’s not the same as saying “It’s my fault.” It’s more like saying, “I love you, and I value our relationship more than I value this temporary feeling of winning.” It’s such an important skill to develop in order to maintain a happy, loving vibe. Even though Fener and I have always had a great relationship, this is particularly important now that emotions can peak in an instant. I feel so sad for people who refuse to humble themselves in this way. It feels good to bow to Nick, to allow him to save face sometimes, and to bypass any hurt feelings that may be looming past a relatively unimportant quarrel. Now, I’m not talking about serious stuff like infidelity and abuse. No. I’m talking about the day-to-day agitations and disagreements, the irritabilities and frustrations. Try it. You might like the way your relationship feels. 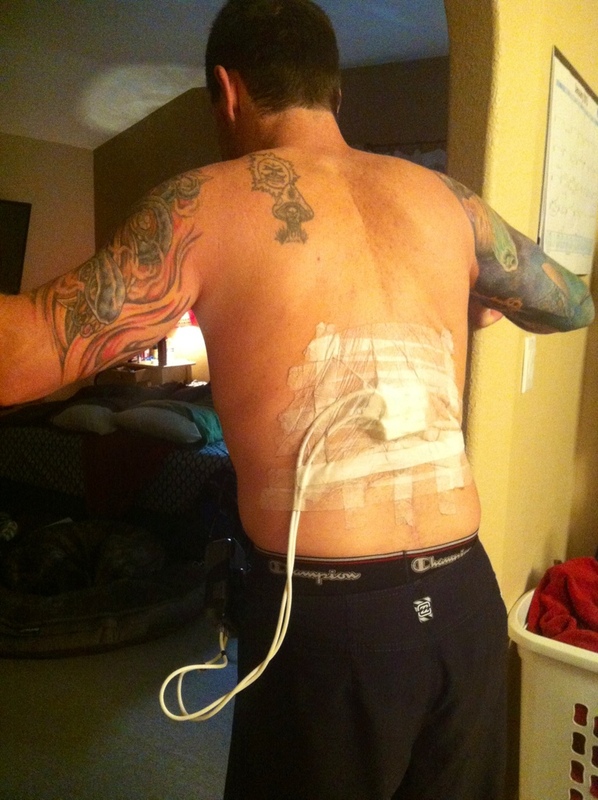 So, Nick had his second-opinion appointment regarding the spinal cord stimulator today. We went down to UCSD to see their lead pain specialist. What a great doctor. He recommended that Nick hold off on the stimulator until he is at the peak of his rehabilitation. We agree, and have been feeling this way since Nick got these new pain meds. Now that his pain is under control, we’re not in a rush. It feels good to be operating from a place of power, rather than a place of panic. When I asked him if he had any other options besides narcotics and the stimulator implant, he recommended marijuana for Nick’s pain. Really? A legitimate doctor, at a teaching hospital, is suggesting pot? He said that many, many of his patients tell him how much marijuana helps with their pain. The only dose specific, oral pill of marijuana is something Nick had already taken in the hospital, and it’s synthetic. They prescribed it to help with his appetite, which it did. But it sure didn’t help with pain. The doctor today couldn’t really prescribe anything though. It was more of an open conversation, discussing, not necessarily endorsing, this “alternative” therapy. Interesting.